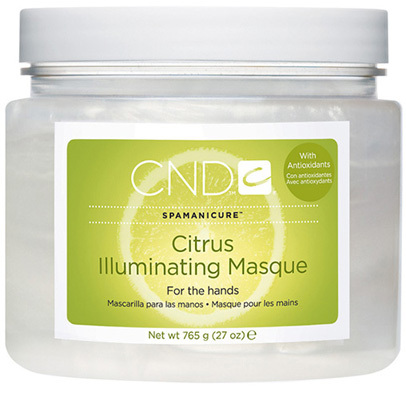 Lustrous hand masque with citrus essential oils and grape seed oil. Helps reduce visible signs of aging with a firming peptide complex. Hands don't have to reveal your true age - with regular care and maintenance, you can improve their appearance. CND® SPAMANICURE® products are specially formulated for the unique needs of hands, so they're ideal for creating younger-looking skin. Citrus SPAMANICURE® have an uplifting feel and fragrance that pampers overworked hands. Citrus essential oils and grape seed oil combine with a firming peptide complex, creating a lustrous treatment that won’t be soon forgotten-like a facial for the hands. Bring newer, brighter skin to the surface with this manicure masque. Help hands look younger, feel better, post-masque. Apply after CND® Citrus Milk Bath and Citrus Moisture Scrub, and complete the spa treatment with CND® Citrus Hydrating Lotion. The full system is designed to bring out the best in hands and nails, creating a clean, clear surface for any nail coating.